You read the shirt right, that's right I am a High Maintenance Girl. I came across High Maintenance Boutique on Instagram and recently got to meet the owner and shop with them at Charleston Fashion Week last month. I was excited to know that they were going to have a booth out at fashion week and I had to shop with them. Their clothing and all the way down to the this statement tee scream everything that I am. I am the definition of a High Maintenance Girl; I do require much attention when I enter a building and trust when you wear one of this boutique's pieces you will have everyone's attention. By being a High Maintenance girl, I am very independent considering I can get the job done no matter how many task are on my plate. This "High Maintenance" t-shirt is easy to pair with any outfit, rather you want to dress it down or dress it up. 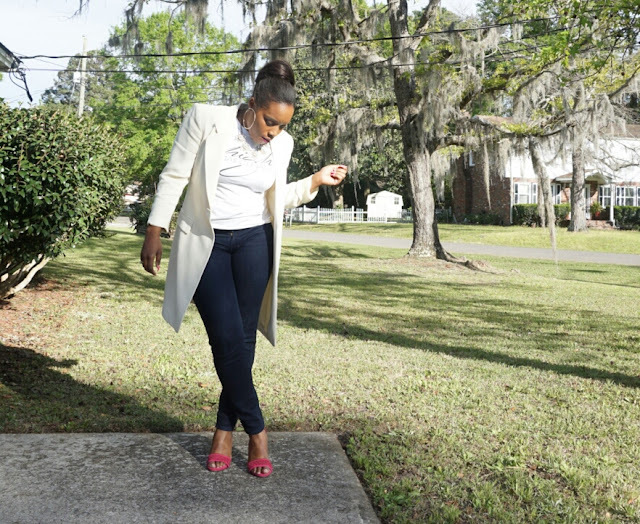 I chose to dress up my t-shirt a bit (especially since I am a High Maintenance Girl) by pairing it with my favorite dark denim jeans, Jones of New York long-tailored blazer, and my pink Antonio Milani strap heels. You Bombshells can all be a High Maintenance Girl by clicking here and shopping with the best!! Express your High Maintenance style now! Love love love! So casual, yet so chic! Accessories on point and you are absolutely right, you are a High Maintenance Girl!!! Rock on! Can't wait to see what you do next! Thanks love, I appreciate it sooo much! !